This salad recipe is simple but sometimes it can be easily overlooked. Picking good papaya and mango is the key to make this salad tasty. Enjoy while the fruits are still at their peak season. 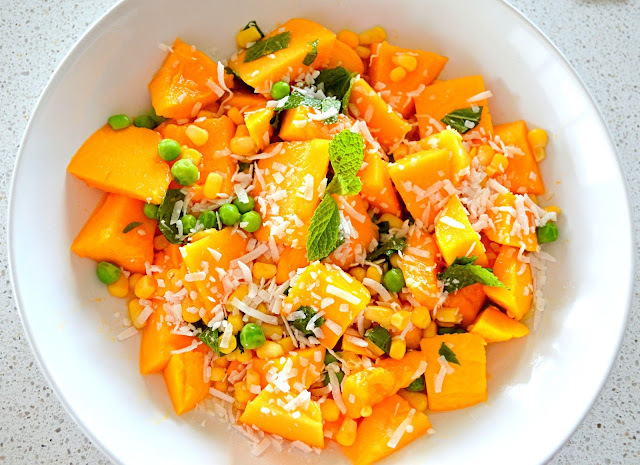 Place papaya, mango, peas, corn and mint in a serving bowl. In a small bowl, mix lime juice and honey together. Pour the juice mixture over the papaya and mango mixture. Toss well. Sprinkle the coconut flakes and serve.